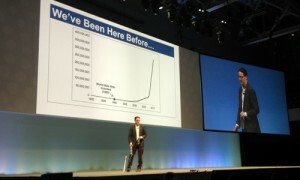 Day three at the INBOUND conference opened with a keynote by Nate Silver, most famously known for his FiveThirtyEight blog where he correctly predicted the 2008 and 2012 presidential elections. Previously I’ve put my thoughts to the keynotes by Seth Godin and Arianna Huffington as to how they relate to your video marketing. I’ll be doing the same with Nate. Nate is a statistical genius. Statistical genius may be a bit of an understatement. Anyone who knows me is aware that when you start talking numbers and data analysis my eyes glaze over. I like to hear the end results and how those results affect the content I need to create because it’s critically important. However the path of correlations to get to that final data analysis usually sounds like someone speaking Arabic to a creative mind like myself. All that being said Nate did a great job of presenting his talk and explaining the big data in a way that almost everyone could understand. Even me. He started with a great example almost everyone was familiar with being Garry Kasparov, the chess champion playing the IBM super computer known as “Deep Blue”. The computer made all of its decisions based on data however Garry was about to see the relationships of the pieces on the board. Something only a human can do. At one point Deep Blue was about to lose and it made an erratic move. Garry went on to win a couple of moves later but that one move didn’t make any sense to Garry and it puzzled him for a long time. It turns out it was just a glitch in the code that told Deep Blue to make a random move as opposed to letting time expire on his move. Garry gave too much credit to the move though. The importance here though is human judgement needs to sort the data between what is a trend and what is just an anomaly. It was a perfect visual example of presenting this data in a way that even a visual learner like me could absorb. Data is the map that you plan your video strategy from. That really rich data like Nate was talking about. In all that noisy data you get back, find the actionable statistics to help feed your video content strategy. Don’t make rash decisions based on a video that is buried on a landing page of your site that has only had a small quantity of traffic. Those results are going to skew your information. Base it on the video on your homepage that is getting a ton of traffic and is driving a ton of conversions. Did some go from your video to read a white paper about a particular feature of your product or service after watching the video? Great! That indicates you need to make more snackable video content around that specific feature to further engage your audience and move them further through your marketing funnel. Using data analysis will help refine the video content you are creating and will streamline the time it takes to convert a curious site visitor into a customer. What Do Voice Actors Do When They Are Sick? Is a 30 Second Video the Perfect Length?